There’s nothing quite like that first bite of an Old-Fashioned Cornbread Dressing at your Thanksgiving feast. Savory, with a hint of sweet, and completely full of flavor, it’s a Southern recipe tradition, and one the whole table is hoping will turn out beautifully for the holiday feast. 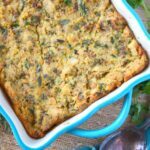 If you’re in charge of the coveted side dish this year, you can’t go wrong with this perfectly moist cornbread dressing, made with sauteed onions and celery, amped up with fresh herbs like sage, thyme, and parsley. 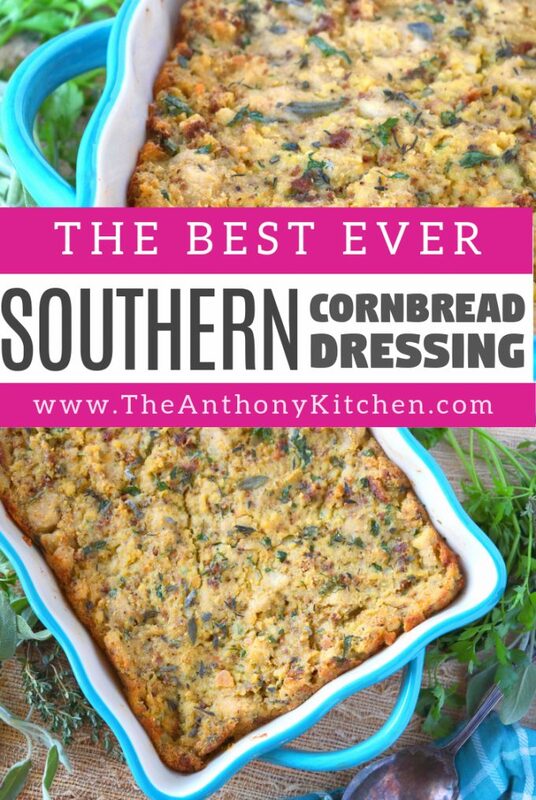 It’s everything your guests will expect in a traditional cornbread dressing…and more. Today, along with this classic Thanksgiving recipe, we’ll also discover the difference between stuffing and dressing, a simple way to spruce up this old classic, make-ahead and reheating tips, and even how to freeze your dressing up to two months in advance! 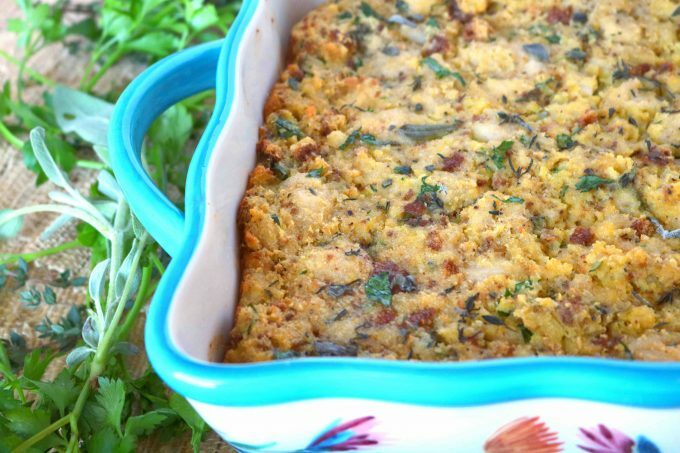 This recipe was inspired by my Grandma Campbell’s Thanksgiving dressing. It is a dish that feels like family and reminds me of home. What better purpose could food serve? I’m sure regardless of where you’re from, you’ve likely heard that cornbread is somewhat of a staple in the South. Old-Fashioned Cornbread Dressing at Thanksgiving is no exception, and this one is a long-established, fan favorite tradition. The main difference between my version and Grandma’s is this: Homemade cornbread and fresh herbs. If you don’t have time for homemade cornbread on Thanksgiving day, I get it and you could easily sub in the store-bought/pre-packaged stuff, no problem. However, the fresh herbs make all the difference in the world, and if you’ve ever cooked with them before, you know first-hand the beauty they add to any given dish when used. WHAT IS STUFFING AND DRESSING? Stuffing and dressing differ in the way they are cooked, however, they are both made up of the same elements. They each consist of bread, broth to moisten, vegetable add-ins of your choosing (most commonly celery, onions, and herbs), as well as eggs to bind it all together. Truth be told, I still slip from time to time and call this Old-Fashioned Cornbread Dressing recipe stuffing way too often. Linguistically, it just seems to be the more popular verbiage of the two. However, this recipe is indeed dressing and not stuffing. So what is stuffing? The word stuffing indicates that the mixture has been stuffed inside of the turkey carcass (or chicken) and cooked with the bird. A dressing is treated more like a casserole in which the mixture is mixed up, then transferred to a large casserole dish to be baked in the oven all on its lonesome…not inside of a bird. I prefer the golden crust that develops cooking the mixture this way, giving it a lovely variation in texture. Southern, Old-Fashioned Cornbread Dressing is easy to make, and it begins with a batch of cornbread, which can be made up 2 days in advance. The cornbread adds just a hint of sweetness to the casserole and brings a lovely balance to the dish overall. Its subtle sweetness is also absolute perfection alongside all the other savory items found at a Thanksgiving feast. After the cornbread is baked, the rest is really just a matter of softening up celery and onion on the stovetop, chopping herbs and bringing it all together for a bake in the oven! Make a batch of cornbread (homemade or store-bought). Cut white bread into cubes — crust removed. Sauté celery and onions in butter. Uncover and bake 25 minutes more. Make the cornbread up to 2 days in advance, or make and freeze up to 2 months in advance! Cut white bread into cubes up to 2 days in advance. Saute celery and onion 1 day in advance. Chop herbs 1 day in advance. 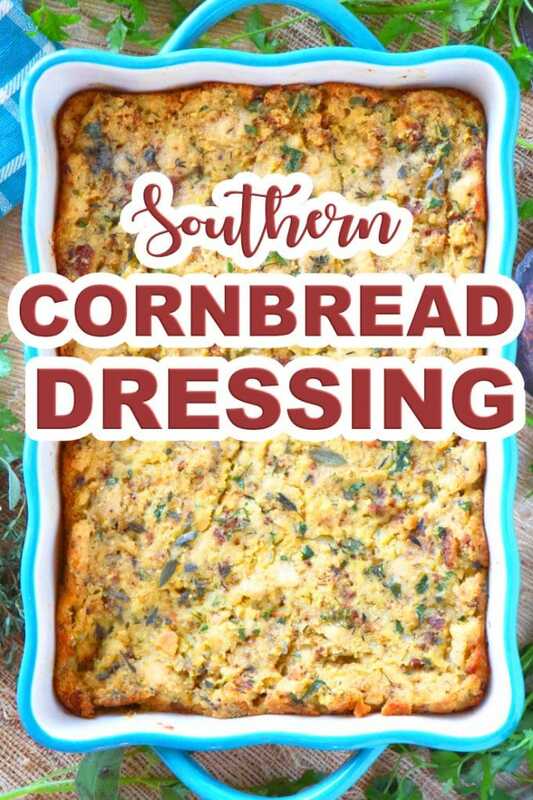 You can also fully assemble and bake cornbread dressing up to 2 days in advance, or freeze for up to 2 months in advance! If freezing, be sure to store it in a snug, airtight, freezer-safe container. Place in the refrigerator to thaw overnight before baking. Place the cold casserole, covered with aluminum foil, in the oven and begin preheating to 325°. Bake, covered, for 50 minutes to 1 hour, until the casserole is completely warmed through. Position your Old-Fashioned Cornbread Dressing smack-dab in between a couple of slices of perfectly roasted turkey and the creamiest mashed potatoes, hit it with a teensy bit of gravy and you cannot go wrong. It also looks particularly lovely right there next to a serving of homemade green bean casserole. Yes, please. It is a beloved tradition, passed down generation to generation, and I can’t imagine a Thanksgiving turkey without it. Once you’ve given this recipe a go, I promise, you’ll feel the same way. Please, enjoy. Sweet Potato Casserole with Marshmallows and Pecans featuring roasted sweet potatoes, warm spices, oven-toasted marshmallows, and candied pecans. Easy Cream Corn Casserole made from scratch with a smooth, creamy filling, topped with Cheddar and Ritz Crackers. Loaded Mashed Potato Casserole can be made ahead and is a total crowd-pleaser! Featuring mashed Russet potatoes, cream cheese, crispy thick-cut, bacon, freshly grated Cheddar cheese, and chopped green onions. Southern Macaroni and Cheese is a cheesy, baked macaroni casserole with a mix of cheeses and a topping panko breadcrumbs. Perfect for holidays and make-ahead dinners! Broccoli Rice Casserole featuring perfectly cooked broccoli and white rice, smothered in a creamy, cheesy homemade Cheddar sauce. A perfectly moist Southern-style dressing flavored with sauteed onions and celery and speckled with fresh herbs like sage, thyme, and parsley. Preheat oven to 350° and have ready a greased 9x13” casserole dish. Remove crust from the loaf of white bread, cut into 1/4" cubes and place in a large mixing bowl. Crumble the cornbread (you should have eight cups) and add it to the mixing bowl as well. Set aside until ready to use. Melt butter in a large sauté pan over medium heat. Add onions and celery to the pan and sauté for 15 minutes or until the vegetables have softened. Set aside and allow to cool slightly. In the large mixing bowl, add the remaining ingredients along with the sautéed vegetables. Using your hands, gently mix ingredients until evenly distributed. Transfer to baking dish, even out the top and cover with aluminum foil. Bake for 45 minutes. Uncover and bake for 20-25 minutes more, until the center no longer jiggles and the top is golden brown. You can prepare the stuffing a day in advance up until the point of baking. Cover and refrigerate, then set out at room temperature 1 hour before you intend to bake it to remove any chill. Resume with the recipe as directed. 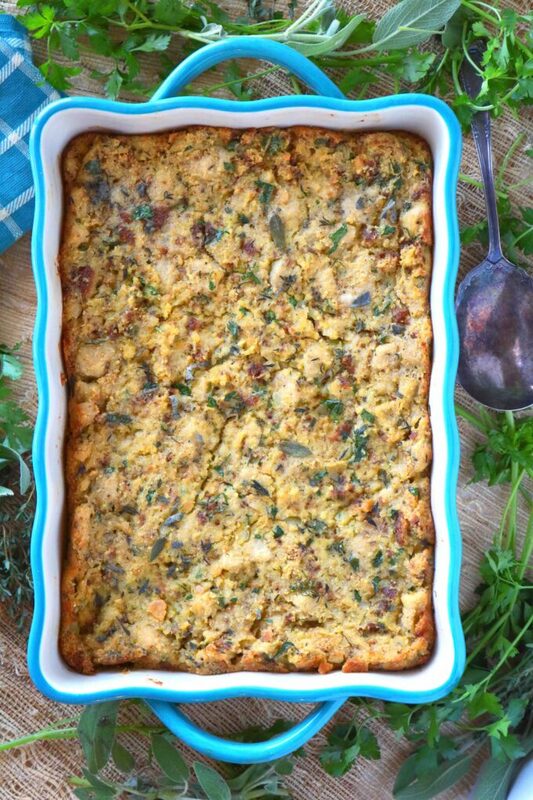 I love cornbread stuffing and this looks fantastic! This sounds similar to the one my in-laws make, but they put sausage in theirs too! I’d love to try your version! My family has always been stuffers but this sounded so delicious I had to try it. Wow! I have never attempted anything other than dried package stuffing, the difference is amazing. Love this recipe, it is absolutely delicious dressing. Can the dressing be made ahead of time & frozen before baking? Yes, it can! I’ve included instructions for this in the blog post 🙂 Thanks, Cindy! Stuffing or Dressing has always been a favorite of mine and yours sounds fabulous. I love this cornbread version that you’ve made. Sounds perfect for the holidays! Stuffing is always a firm favourite at any celebratory meal. This slightly different version sounds delicious and full of flavour. A perfect side dish. This dish looks so good! The perfect side for Thanksgiving. I also love how you explained the difference between stuffing and dressing. 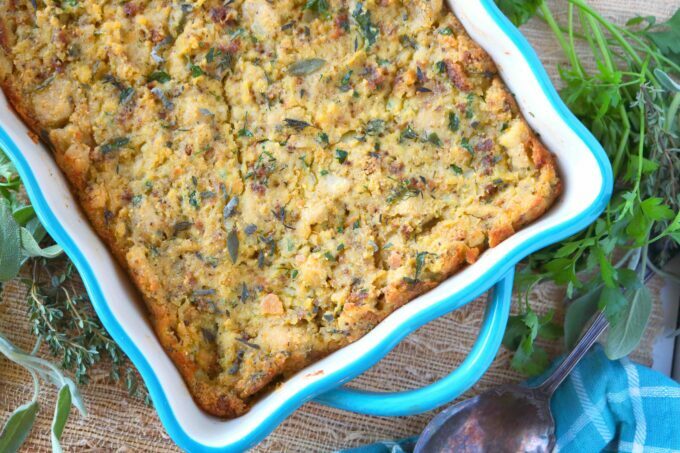 I LOVE cornbread stuffing! I think I’d serve this up all fall and winter. I love that it’s like a casserole — make it feel like the whole meal! I’ve never thought about freezing dressing before. Looking forward to trying this new take on cornbread.